Every once in a while you just have to get away from the normal drudgeries of life. Fortunately, someone was brilliant enough to come along and invent Vacations. However, leaving on vacation almost always entails leaving your normal gaming group behind, and spending a lot more time with family members who may or may not be as interested in games as you are. This means that if you want to get some gaming in you’re going to have to convince people to try out something new. This past week I went camping in Michigan with a large number of extended family. While I didn’t quite get all the games going that I would have liked, I did manage to scrape up a few games of Tobago, 6-player Dominion, The Resistance, and Kill Dr. Lucky. Non-boardgamers aren’t immediately grabbed by the prospect of playing a game. Even if they’re interested in playing, if you don’t push for a game to get started they will patiently sit and wait. 2. Bring simpler games first, and play up the ease of it – but not too much. Even those who have tasted Catan might assume that your games are overly complex and impossible for them to master, but there are many games that are definitely easy for anyone to learn. However, remember that these games are different than what most people are used to. They require different ways of thinking and a bit more than “roll the dice, move forward.” If you downplayed the requirement of thought and strategy too much, they may feel overwhelmed when you start to explain the rules. Tobago surprisingly didn’t go over quite as well as I had expected, and I think part of it was the added complexity of having to think in a different way than people are used to. 3. Connect games to more well-known counterparts, even if the connection is loose. I’ve found that people are more likely to grasp and enjoy a game if it connects to something they already know. 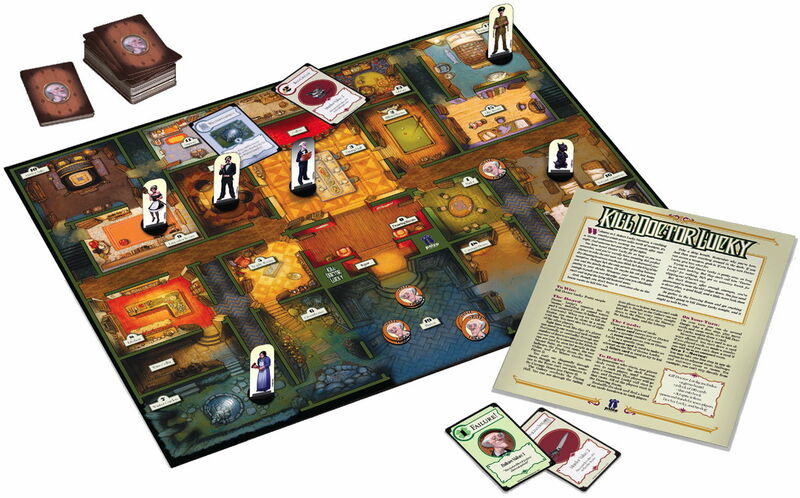 Best example I have: when I introduce Kill Dr. Lucky, I always say that “It’s like clue, but the opposite – you try to kill the guy instead of finding out who did it.” Another line I use is “It’s like Clue, but fun.” In reality, the only thing KDL shares with Clue is the Theme – group of people moving around a Mansion. 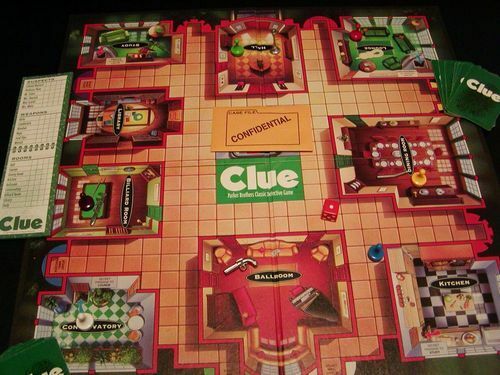 However, most people have played Clue and the concept of moving from room to room is immediately grasped. The people feel like they can understand this, allowing you to feed the more complex rules (such as the oddly variable turn order) to open minds ready to accept them. People have had harder times understanding equally complex or even more simple games than KDL and I’m pretty sure it’s because of this idea. In addition, throwing in the “It’s like Clue, but fun…” line acknowledges the fact that some board games are just not fun. People may assume that because they don’t like Clue or Monopoly, they don’t like board games. When a board-gamer assures them that the games they don’t like are, in fact, not very good games, they will be more open to try your new and exciting options. This may not be a problem for some of you, but if you are a quiet, introverted person, you might sound a bit dull when introducing a game. If you aren’t excited about the game you’re introducing, why should anyone else be? You need to show confidence and energy about your games, to encourage people to have fun and run with their imaginations – to really play when they’re playing. When you introduce a game, you will probably get 5 or 6 questions every round. Be patient, but also be helpful. Teach strategies. Allow people to take back moves if they missed an element that affects what they would do. Offer advice but don’t be pushy. Make them feel like you’re not there to beat them over the head with your board-gaming skills, but that you’d like to bring the fun to everyone. Even if that means you lose to a beginner, isn’t it worth it if that person goes out and buys the game for their family when the vacation is over? There are a lot of words that we as board gamers use that are, I think, very intimidating to non-boardgamers. Using these words when explaining a game always makes it harder for a new player to learn, because they have to worry about the meaning of the term as well as how it is implemented in the game. This can make the process of explaining more challenging, but will ease the new player in better. If you have to use special terms, make sure to explain them clearly as you start going through the rules. Avoid at all costs using terms like “Deckbuilding,” “tile-laying” and “worker-placement” when describing a game to non-gamers as you introduce it to them, as these immediately sound like complex ultra-strategic mechanics with hundreds of rules. Wait til after they have played and enjoyed the game, and then you can say “this is a deck-building game.” This way they’ll have something to associate with the term. In the end, I think that Kill Dr. Lucky was the biggest hit of the week, and I only wish I had brought it out earlier. With a higher player limit, more people were able to get involved than the normal 4. The colorful art of the Paizo board and characters sparked interest, and the hilarious failure cards kept even the spectators entertained. Do you guys have any tips, strategies, or ideas for introducing games to non-gaming family members? Is Your Relationship Ready for Board Games? I think I disagree with your last point there futurewolfie. In my experience with explaining games to my younger brothers-in-law its helpful to give them the idea of it in a few short phrases right off the bat. It seems to focus them on the key elements. When I was explaining “Zombies!! !” to them I kicked it off by saying it was a tile-laying, zombie killing game. These are the two biggest elements of the game. Tile-laying might sound like jargon to some, but it is exactly what it sounds like (you lay down tiles) and immediately describing it like that made them give greater thought to where they would place their city tiles. I continue to disagree with your disagreement. Your example is of young boys, who I’ve found are really good at learning complex rules and picking up on terms quickly. Even if they aren’t regular “boardgamers” so to speak, they still learn quickly and pretty much count inside the demographic. Try explaining games to non-gamers of all kinds, especially older people. Believe me, I’ve tried explaining games to a large variety of people and I’ve consistently run into the problem of them not understanding what I mean when I use a “clique” term.